The first Monongahela Incline was built by civil and mining engineer John J. Endres with assistance from engineers Samuel Diescher and Caroline Endres. All three engineers hailed from Cincinnati. John J. Endres was born in Prussia (Germany). He worked as an engineer in the mining industry in Prussia before immigrating to the U.S.A. in 1866. He moved to Cincinnati, Ohio where he designed inclined planes for mining and construction. Endres was a very talented and creative engineer who was awarded the Monongahela Incline project after his proposal was chosen over competing proposals from engineers around the country. 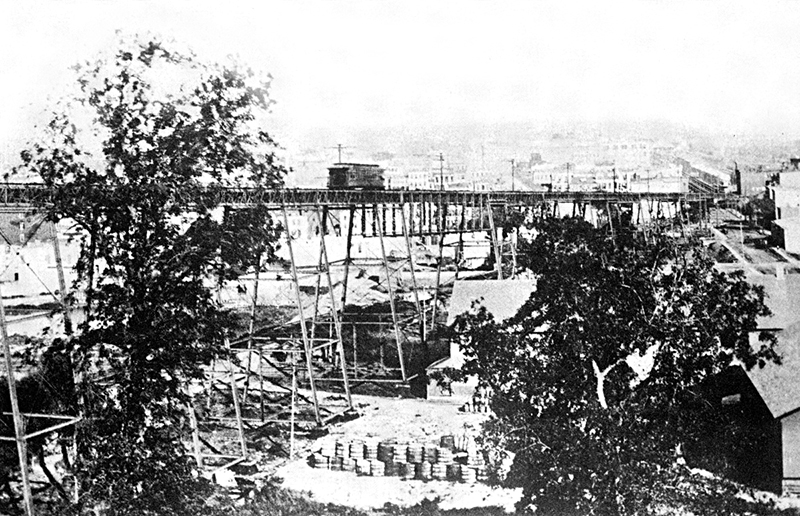 Following the completion of the Mon Incline, John and Caroline Endres began work on the Mount Oliver Incline which ran from 12th Street up to Warrington Avenue and operated for almost 80 years (1872 to 1951). Information on the life of John Endres is a bit more difficult to come by than Samuel Diescher because Diescher settled in Pittsburgh shortly after completion of the Mon Incline. Diescher had a long and illustrious career here which is well documented. 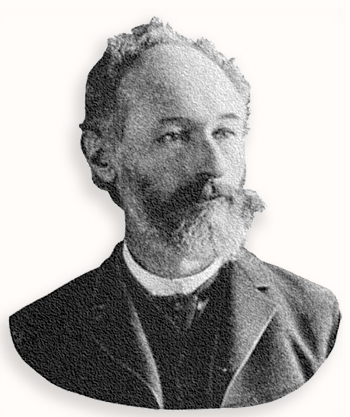 Endres, on the other hand, worked in Illinois, Ohio, Pennsylvania, New Jersey and New York on a wide variety of engineering work from designing unique railway and inclined plane equipment to engineering mining and manufacturing equipment. He was awarded at least 10 patents after his time in Pittsburgh, and went on to become the Chief Engineer of the North Hudson County Railway in Hoboken, New Jersey. He designed the Hoboken Cable Elevated Railroad pictured below which was more than a mile long. For this incline, Endres engineered and patented a system whereby the cars would grip the cable for going up the steep incline, then release the cable when it was no longer needed. The Hoboken Cable Elevated Railway was operated using cable grips that John J. Endres patented. Endres was apparently quite busy during the time that he was in Pittsburgh. He engineered the first process to wash bituminous coal in 1869 in Alpsville, PA., 24 miles from Pittsburgh. The system used a piston jig which was capable of washing 10 tons of coal per hour. He went on to build coal washing plants in Illinois, Ohio and New Jersey. He also patented a process to create fuel bricks from powdered coal waste. Unfortunately, John Endres died suddenly on May 24, 1889 at only 47 years of age in Hoboken, New Jersey (according to death notices in Hoboken, New York, and Pittsburgh). He was cremated and his ashes were sent to Bonn, Germany, on the River Rhine which may have been where he was originally from. I wonder if J.J. Endres and his fellow engineers could have imagined that the Monongahela Incline would still be running strong almost a century and a half after its construction. Samuel Diescher was born in Budapest, Hungary in 1839. His father, József Diescher (1811-1874), was a prominent Hungarian architect and building contractor. Samuel was educated in Germany at Karlsruhe Polytechnique and in Switzerland at the University of Zurich. In 1866, Diescher immigrated to Cincinnati, Ohio where he built inclined planes for mining and construction (i.e. not passengers). He joined John Endres in Pittsburgh in 1869 to assist in the construction of the first passenger funicular, the Monongahela Incline. Following the construction of the Mon Incline, Diescher returned to Cincinnati briefly and married Caroline Endres there in 1872. He shortly returned to Pittsburgh where he lived until his death in 1915. Samuel Diescher was a brilliant and versatile engineer who went on to build a large portion of Pittsburgh's transportation infrastructure, including well over a dozen inclines including the still-in-operation Duquesne Incline. He also designed a wide variety of machinery for Pittsburgh's steel industry, supervised road construction including Brownsville Road, and notably, assisted George Washington Gale Ferris Jr. in the building of the first Ferris Wheel for the 1893 World's Columbian Exposition in Chicago. The Ferris Wheel was built in Pittsburgh by the G.W.G. Ferris & Co. which was a Pittsburgh engineering firm that tested metals for railroads and bridges. Caroline Endres was also born in Prussia in 1846 and immigrated to Cincinatti, Ohio about 1866. She was one of the first female engineers in the United States, apparently having been trained in Europe. 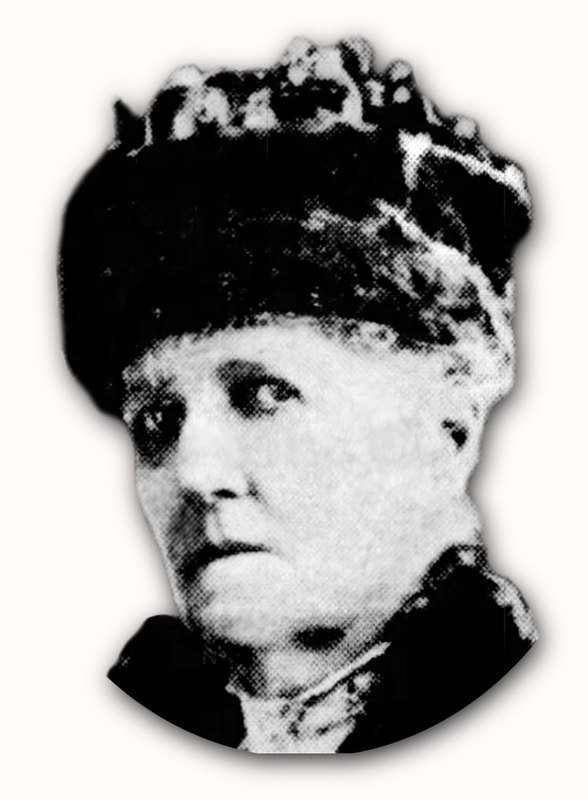 She assisted John Endres and Samuel Diescher with the design and supervision of the construction of the Monongahela Incline. In late summer 1869, she moved to the Monongahela House, one of the finest hotels in Pittsburgh. The Monongahela House was located at the intersection of Smithfield Street and what is now Fort Pitt Boulevard (then Water Street), directly across the Monongahela River from where the Monongahela Incline was being built. This would have afforded Caroline a very convenient base for her work on the Monongahela and Mount Oliver inclines. Caroline lived there for about two years during the construction of these two inclines. Samuel Diescher and Caroline (recorded as Karolina in marriage records) were married in Cincinnati in 1872. They returned to Pittsburgh where they settled and raised a family. It is a mystery whether Caroline used her engineering skills after the Monongahela and Mount Oliver Inclines were completed. Caroline died in 1930 at age 84, and is buried in Allegheny Cemetery in Pittsburgh next to her husband. Two of her sons joined their father in his engineering business after the turn of the century as Samuel Diescher and Sons. If the age reported in his death notices is accurate, John J. Endres could not possibly have been Caroline Endres Diescher's father. This means that he built the original Monongahela Incline at the age of only 27 or 28 years old! In fact, he would have been a few years younger than 'his young assistant' Samuel Diescher. John Endres death notice in Pittsburg Dispatch. Obituary from The American Street Railway Association Annual Meeting December, 1889. Virtually every resource that I have seen refers to Caroline Endres as John Endres daughter, but if the evidence that John Endres was only four years older than Caroline is accurate, she was more likely John's sister. 5:30 a.m. to 12:45 a.m.
For up-to-the-minute information on service interruptions or delays, always check the Port Authority's Twitter feed. The Mon Incline is a major tourist attraction with many visitors, but it's also vital transportation to the commuters who use it to get to work and home. Use these Pro Tips to make your experience more enjoyable.